In this article, we propose a vectored system by using both common mode (CM) and differential mode (DM) signals in upstream VDSL. We first develop a multi-input multi-output (MIMO) CM channel by using the single-pair CM and MIMO DM channels proposed recently, and study the characteristics of the resultant CM-DM channel matrix. We then propose a low complexity receiver structure in which the CM and DM signals of each twisted-pair (TP) are combined before the application of a MIMO zero forcing (ZF) receiver. We study capacity of the proposed system, and show that the vectored CM-DM processing provides higher data-rates at longer loop-lengths. In the absence of alien crosstalk, application of the ZF receiver on the vectored CM-DM signals yields performance close to the single user bound (SUB). 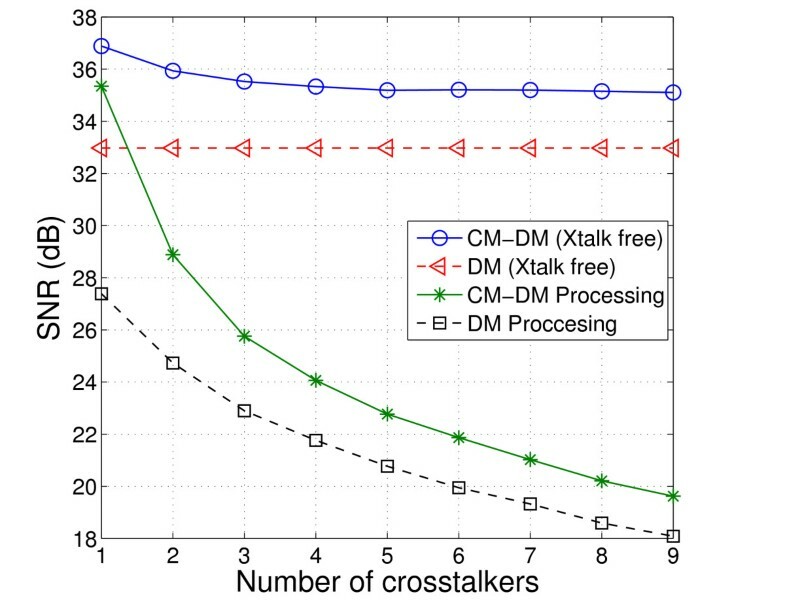 In the presence of alien crosstalk, we show that the vectored CM-DM processing exploits the spatial correlation of CM and DM signals and provides higher data rates than with DM processing only. Simulation results validate the analysis and demonstrate the importance of CM-DM joint processing in vectored VDSL systems. Very high-speed digital subscriber line (VDSL) systems optimize the use of available bandwidth of the telephone lines for broadband transmissions . This advanced technology can support the deployment of "triple play services" by providing high data rates (potentially upto 100 Mbps) through copper wires. Twisted pairs (TPs) run from the central office (CO) to the respective customer premise equipments (CPEs) in order to provide dedicated data rates for each user. The use of the higher bandwidth frequencies (upto 30 MHz) generates electromagnetic couplings that cause significant crosstalk among TPs, which degrades the performance of VDSL systems. The crosstalk that originates from the subscribers enjoying similar DSL service in a coordinated system is referred to as self-crosstalk . In addition to the self-crosstalk, alien crosstalk that arises from other sources (for example, radio ingress) and non-coordinated users (enjoying other DSL services) severely limits the rates obtained by the VDSL systems . Differential-mode (DM) processing that uses voltage differences between the two wires of the TP for the signal transmission and reception is a conventional technique to reduce the interferences, including radio ingress. In spite of this, crosstalk is the major performance limiting factor for the high-bandwidth VDSL systems. Another factor limiting data rates is the significant attenuation with large loop lengths, resulting in marginal data rates even when all upstream bands are used. We demonstrate in this article that use of common-mode (CM) signals can result in significant enhancement in rates in VDSL systems as compared to systems using DM-only processing. In addition, it can help deal with alien crosstalk. The additional CM signal can be obtained by using the arithmetic mean of the voltages, measured between each wire of the TP and ground . It is shown in  that this CM signal can be readily obtained with very little extra hardware. The CM channel can also be realized by using an alternative reference point like binder sheath  or one of the wires in the binder . It has been shown in  that coordinated processing of the DM signals in all TPs (referred to as vectoring) enables cancelation of the far-end crosstalk and hence results in enormous rate increase in the DSL system. As is well known, the use of discrete multi-tone (DMT) modulation in the VDSL system makes tone-wise processing of the received signals possible. In vectored systems with N TPs, this results in an N × N multi-input multi-output (MIMO) system at each of the 4096 tones used. In , it was shown that a decision feedback equalizer (DFE) based receiver can result in rates close to the single user bound (SUB). Subsequently, it was established in  that a simple zero forcing (ZF) receiver at each tone can help achieve rates very close to the SUB. Recently, an iterative receiver based on the SAGE algorithm has been proposed in  to eliminate the channel matrix inversion requirement of the ZF receiver while achieving near-optimal performance. When alien crosstalk is present, it is clear that various linear and non-linear receivers can be readily applied after a pre-whitening filter (see [9, 10], and references therein). It is noted that noise is spatially correlated across TPs due to the introduction of crosstalk from an alien source . When the ZF-based receiver  is applied after noise whitening, it suffers from a significant performance loss due to the ill-conditioning of the channel after the whitening process as discussed in . Chen et al. have shown that a non-linear DFE-ZF can achieve data rate higher than a ZF receiver, though with an increase in computational complexity. In our previous study , we have shown that the SAGE based iterative receiver can effectively cancel the alien crosstalk to achieve a higher rate (with a little extra complexity). The MMSE based receivers have been proposed in [11, 12] as a tradeoff between rate and complexity by eliminating the use of a whitening filter. Computational complexity and power consumption remain the major implementation hurdles in vectored DSL systems. Linear ZF receiver requires O ( N 2 ) real-time computation at each of the 4096 tones. Besides this, some offline computation is required to update the inverse matrix at each tone. This is very high for real-time implementation with restrictions in computational complexity and power consumption. Several partial cancelers have been suggested [13, 14] that selectively cancel crosstalk and tradeoff rate for reduced complexity. As noted already, the CM channel provides an additional mode for transmission and reception of signals through the copper wires. The CM signals at the CO are a result of leakage of transmitted DM signals due to imbalances in the TPs. Clearly, the CM signals are highly correlated with the DM signals , and consist primarily of the crosstalk (from the neighboring wires) and external noises. This suggests that the CM signals can be used as a reference for estimation of the interferences. For this reason, the CM signals have been utilized to mitigate radio frequency interference (RFI) ingress (see  and references therein). Yeap et al. and Kamkar-Parsi et al. have proposed CM-based adaptive cancelers to mitigate a single wideband noise in downstream transmissions. Pierrugues et al. have used a CM signal that is orthogonal to the transmitted signal to mitigate a single noise source at the CPE. The proposed scheme is effective since the correlation between CM and DM noise is close to unity. By considering a single-TP DSL system, an algorithm based on a weighted combination of CM and DM signals has been presented in  to cancel a single disturber. The authors have provided extensive simulations and analytical results to show that the proposed algorithm is effective when adapted in the absence of the transmitted signal. These applications of CM signal at the receiver side for interference cancelation can be translated into improved capacity in DSL systems. Explicitly, capacity analysis using CM-aided reception has been discussed in [4, 21, 22]. It has been shown in  by cable measurements, and through channel capacity expressions that the CM signals can provide significant capacity improvements, especially at high signal-to-noise ratio (SNR) levels, and low CM noise power. However, the capacity drops significantly with an increase in the number of disturbers . This observation has been made rigorous in . Specifically, Magesacher et al. have investigated the capacity of the CM-aided reception by considering a single DSL user. They have shown that the exploitation of CM signal can result in doubling of capacity than that possible by using DM signals alone. Note that these works have focused on cancelation of a single disturber only, by considering a non-vectored DSL system. To further enhance the performance by canceling a large number of disturbers, CM-aided receive processing combined with vectored transmissions is well motivated for the considered system . Recently, transmission of signals in the CM channel along with the co-reception of CM signals has also been studied in . In this article, we propose a CM-DM system model by vectoring the co-received CM and DM signals for upstream transmissions at the CO. We first employ a simple low complexity receiver which linearly combines the CM and DM signals on each TP (so as to maximize SNR for each user) and then use the signal-level coordination for the resultant signals. Since the size of the resultant vectored model remains equal to that of the DM model, the crosstalk cancelation algorithms developed for the DM system can be readily applied on the proposed CM-DM system model. To assess performance of the existing crosstalk cancelers on the proposed system model, we study characteristics of the equivalent CM-DM channel at each tone. To do so, we model (due to non-availability of an analytical model for the CM channel) a CM vectored channel by extending the recently proposed single-TP CM channel , and modify it to include the statistical dispersion (using the approach for DM channels in ). In particular, we show that the CM-DM channel matrix is more column-wise diagonally dominant (CWDD) than the DM channel at high frequency and/or longer loop-length. This fact is useful for development of efficient algorithms for crosstalk cancelation. 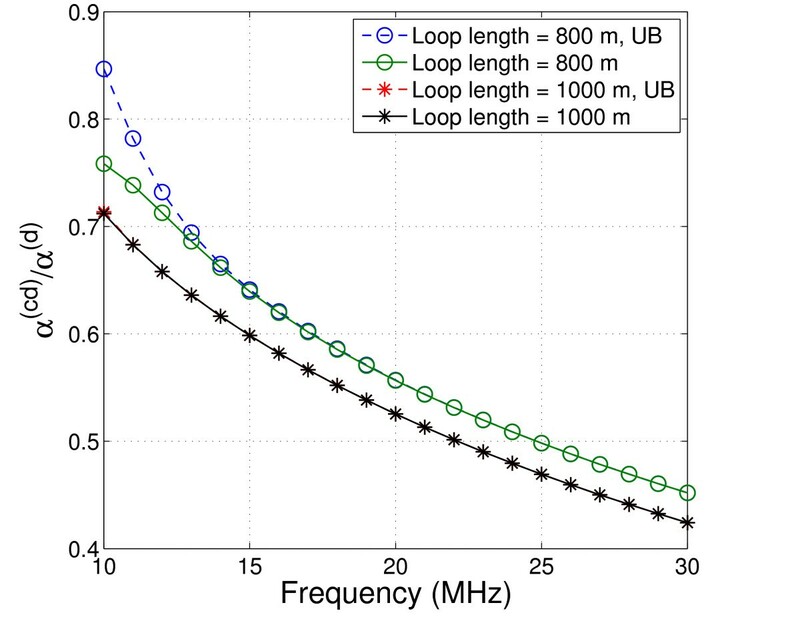 We also obtain the SUB of the proposed system, and show that the CM-DM processing increases reach of the VDSL service by providing higher rates at longer loop-lengths. This advantage is accrued because of the fact that attenuation in the CM channel is smaller than the attenuation in the DM channel . We extend the ZF receiver of the DM system for the proposed system, derive a simple lower bound on the capacity, and show that the SUB of CM-DM system is achieved by the ZF receiver. Finally, we use CM-DM processing to exploit high correlation of CM and DM signals for the mitigation of alien crosstalk. We derive an upper bound on the SUB after noise whitening and show that higher data-rate is attained with the considered system. Computer simulations are presented to further demonstrate the data-rate performance of the vectored CM-DM processing in each of the upstream frequency bands. The remainder of this article is organized as follows. In Section 2, we describe the DSL system model. In Section 3, we discuss a model for the CM vectored channel. We present the issue of CM-DM combining in Section 4, and elaborate on its applications to the vectored CM-DM processing in Section 5. The CM signals are exploited for the alien crosstalk cancelation in Section 6. Section 7 presents computer simulations. Finally, Section 8 provides the main conclusions. Notation: Superscripts (d)and (c)indicate the DM and CM signals/values, respectively. Vectors and matrices are boldface small and capital letters, respectively. A(:,i) denotes the i th column of the matrix A and A ij denotes the ij th element of matrix A. Further, diag (A) denotes a diagonal matrix consisting of the diagonal elements of A. We use ≜ to denote equality by definition. The operators tr(·), | · |, and det(·) represents trace, absolute value, and determinant, respectively, while (·)*, (·) T , and (·)† denote the conjugate, transpose, and conjugate transpose, respectively. p(x,y) denotes the joint density function of random variable X and Y.
where V i ( d ) is a component of the DM additive noise that includes the alien and thermal noise at the DM port. Similarly, V i ( c ) is a component of the CM additive noise that includes the alien and thermal noise at the CM port. H i j ( d ) and H i j ( c ) denote the crosstalk coupling coefficients from the j th to the i th TP. Our model in (1) and (2) is a general case of that presented in . By considering downstream transmissions, Pierrugues et al. have assumed that the CM signal is strongly correlated with external noise but orthogonal to the transmitted signal. As such, the CM signal receives the alien noise only and rejects (X i = 0 in (2)) the useful signal. It is also noted that the system of Equations (1) and (2) is a special case of that in [5, (1), (2)] where the CM channel using the binder-sheath has also been used for signal transmissions. However, in our treatment here we focus on CM reception only, and avoid consideration of transmission over the CM channel. While this concept certainly holds interesting possibilities, we believe that transmission over the CM channel is still associated with a number of difficulties, and would require further maturing of associated technologies, issues and standards before their serious induction and deployment. We also note that exploiting reception of the CM signals in the upstream requires changes only in the equipment at the CO, and not at the CPE. where y ( d ) = Y 1 ( d ) , Y 2 ( d ) , . . . , Y N ( d ) T , y ( c ) = Y 1 ( c ) , Y 2 ( c ) , . . . , Y N ( c ) T , x = [ X 1 , X 2 , . . . , X N ] T , v ( d ) = V 1 ( d ) , V 2 ( d ) , . . . , V N ( d ) T , and v ( c ) = V 1 ( c ) , V 2 ( c ) , . . . , V N ( c ) T are N-dimensional vectors of received (DM and CM), transmitted, and noise samples (DM and CM), respectively. H(d)and H(c)are N × N matrices with ij th element defined as H i j ( d ) = H ( d ) i j , and H i j ( c ) = H ( c ) i j . In the following section, we formulate a CM channel model H(c)and study its CWDD property. We later use this to study properties of the combined CM-DM channel. The DM channel model is well established (verified through measurements) and widely adopted in literature (see [23–25], and references therein). In particular, a stochastic MIMO channel model based on Gaussian distribution is proposed in  that extends the conventional 99% worst case model . Similarly, crosstalk models based on beta distribution  and sum-of-sinusoids  have been suggested to characterize the crosstalk accurately. However, an analytical model for the CM channel is not well studied in the literature. In , a split-pair signaling (based on the multi-conductor transmission-line theory) that offers 2N - 1 modes of transmissions in a binder of N pairs is presented by considering one of the wires as a joint common reference for all other wires. Although this configuration can provide significant improvement in data rate, the presence of ingress or egress limits the potential use of split-pair (usually not twisted) signalling. A CM channel model has also been suggested in  by considering the metallic-sheath of the binder as a common reference. This configuration (of 2N modes) is more reliable than the split-pair signalling and significantly reduces the effect of ingress and egress on the binder provided the metallic sheath is grounded properly. A CM channel has also been developed using the shield of the binder as a reference point . In , achievable throughput using this model has been investigated in the presence of radio ingress. It is noted that no experimental data are available for the transfer functions of any of the CM channel suggested so far. where X(f) (that models the magnitude variation) is a Gaussian random variable in dB with mean μdB = 2.33 σdB and variance σdB. The model presented in  is found to perform well for a large range of crosstalk situations. Particularly, this model is valid as long as μdB = 2.33 σdB, which is typically observed at lower frequencies. However, for higher frequencies, this pair of μdB and σdB values, tends to overestimate the crosstalk. For higher frequencies, the applicable values of these quantities have been extensively measured upto 30 MHz (and were made available to us by Conexant Systems Inc.), which have been used in the simulations/numerical values presented in Section 7.
ϕ ( f ) = e J ∠ H line ( c ) - ∠ H line ( d ) . Unbalance function B(f) of lines is usually a function of frequency and determines the conversion of signals from differential-mode to common-mode. ϕ(f) compensates the slower line propagation of CM compared with that of the DM. It is observed from (6) that the coupling and direct path components H(c)can be obtained from the corresponding components of DM channel H(d)by using the leakage factor B(f). α ( d ) = max i , j ≠ i H j i ( d ) H i i ( d ) . α ( c ) = max i , j ≠ i H j i ( c ) H i i ( c ) . η ( c / d ) = α ( c ) α ( d ) = B 2 ( f ) H i i ( d ) . We observe from (11) that the CWDD characteristic of the CM channel is also dependent on frequency and loop length. In particular, the CM channel is more diagonally dominant than the DM channel at high frequencies and/or longer loop-lengths. This is due to the fact that both B(f) and H i i ( d ) decrease with frequency while the latter also decreases with an increase in the loop length. A proper understanding of the CWDD characteristic of the CM channel can assist in understanding the potential gains due to joint CM-DM processing. To this end, we performed computer simulations to investigate the behavior of CWDD characteristic of the CM channel, and compare it with that of the DM channel. The ratios of CWDD parameters of both channels in three upstream bandwidths over various loop lengths are plotted in Figure 1. The frequency ranges of 3.75 to 5.2 MHz, 8.5 to 12 MHz, and 18.1 to 30 MHz are referred to as a low-frequency band (LFB), mid-frequency band (MFB) and high-frequency band (HFB), respectively. Unlike in all previous studies, we also study characteristics of the channel in the HFB, where the characteristics are quite different from those of the LFB and MFB. Figure 1a shows that the CM channel is not as CWDD as the DM channel in the LFB for shorter loop lengths. However, the CWDD property improves with an increase in frequency and loop length as shown in Figure 1b,c. The main conclusion of these studies is that the CM channel is more CWDD than the DM channel at higher frequencies and/or longer loop-lengths, a fact which is consistent with the analytical expression in (11). In the HFB, the CWDD nature of the DM matrix is quite weak as α ( d ) increases with frequency and loop length. However, the variation of α ( c ) with frequency and loop length is opposite to that of α ( d ) . Thus, the CM MIMO channel is well conditioned (in as far as the CWDD property is concerned) at a higher bandwidth and/or longer loop-length (as compared to DM MIMO channel), which motivates the use of CM signals along with DM signals for crosstalk cancelation. Ratio of CM to DM CWDD parameters at various loop lengths in all three upstream bands. In this section, we employ CM-DM joint processing by linearly combining the CM and DM signals at each TP to improve the SNR of each user while treating all the crosstalk as interference. Vectored crosstalk cancelation scheme based on such a processing is studied in the following section. We first assume the presence of white noise only, while spatially correlated noise due to the alien crosstalk is discussed in Section 6.
where V i ′ ( d ) = V i ( d ) / H i i ( d ) , and V i ′ ( c ) = V i ( c ) / H i i ( c ) are noise terms after FEQ. We assume that the central limit theorem holds for the second term of each of the two equations in (12), so that it can be regarded as a circular symmetric Gaussian random variable. This is reasonable, since the far end crosstalk (FEXT) component consists of the weighted sum of independent symbols. With this, ∑ j = 1 , j ≠ i N H i j ( d ) H i i ( d ) X j is Gaussian with mean zero and variance equal to FEXT i ( d ) = ∑ j = 1 , j ≠ i N H i j ( d ) H i i ( d ) 2 σ x , j 2 giving SNR without FEXT cancelation for the i th user as SNR i , fext ( d ) = σ x , i 2 FEXT i ( d ) + σ υ ′ , i 2 ( d ) . Here, σ υ ′ , i 2 ( d ) is the variance of the noise V i ′ ( d ) after FEQ. Similarly, the FEXT component of the CM signal has zero mean and variance FEXT i ( c ) = ∑ j = 1 , j ≠ i N H i j ( c ) H i i ( c ) 2 σ x , j 2 , thus resulting in an SNR of SNR i , fact ( c ) = σ x , i 2 FEXT i ( c ) + σ υ ′ , i 2 ( c ) . Similar to the DM system, σ υ ′ , i 2 ( c ) is the variance of the noise V i ′ ( c ) after FEQ. It is noted that in the presence of a large number of disturbers with high power spectral densities (PSD), SNR i , fact ( d ) is quite low, necessitating the cancelation of crosstalk. When the FEXT is canceled, crosstalk-free SNR (bit loading is based on this quantity) S i ( d ) = σ x , i 2 σ υ ′ , i 2 ( d ) can be obtained. As stated earlier, we use the CM signals for the cancelation of interferences to improve the performance of the DM channel. X ^ i = 1 T R i - 1 1 - 1 1 T R i - 1 z i ( c d ) . R i = R i ( d d ) R i ( d c ) R i ( c d ) R i ( c c ) = ∑ j = 1 , j ≠ i N H i j ( d ) 2 H i i ( d ) 2 σ x , j 2 + σ υ , i 2 ( d ) H i i ( d ) 2 ∑ j = 1 , j ≠ i N H i j ( d ) H i j * ( c ) H i i ( d ) H i i * ( c ) σ x , j 2 ∑ j = 1 , j ≠ i N H i j ( c ) H i j * ( d ) H i i ( c ) H i i * ( d ) σ x , j 2 ∑ j = 1 , j ≠ i N H i j ( c ) 2 H i i ( c ) 2 σ x , j 2 + σ υ , i 2 ( c ) H i i ( c ) 2 . K i = R i ( d d ) - R i ( d c ) R i ( c c ) - R i ( c d ) . K i = S i ( c ) 1 + S i ( d ) ∑ j ≠ i H i j ( d ) H i i ( d ) 2 - H i j ( d ) H i j * ( c ) H i i ( d ) H i i * ( c ) S i ( d ) 1 + S i ( c ) ∑ j ≠ i H i j ( c ) H i i ( c ) 2 - H i j * ( d ) H i j ( c ) H i i * ( d ) H i i ( c ) = SNR i , fact ( c ) SNR i , fact ( d ) 1 - SNR i , fact ( d ) ∑ j ≠ i H i j ( d ) H i j * ( c ) H i i ( d ) H i i * ( c ) 1 - SNR i , fext ( c ) ∑ j ≠ i H i j * ( d ) H i j ( c ) H i i * ( d ) H i i ( c ) . K i ≈ SNR i , fext ( c ) SNR i , fext ( d ) . z i ( c d ) = 1 X i + e i ( c d ) . SNR performance of the single-TP CM-DM and DM processing with a frequency tone of 12 MHz at a loop length of 500 m.
where h ¯ i ( c d ) = [ H i i ( d ) , H i i ( c ) ] T , and R ¯ i is the covariance matrix of total noise (white noise and FEXT) before FEQ. We can deduce from Figure 2 that the joint single-TP CM-DM processing achieves capacity close to the theoretical capacity in the presence of a few cross-talker only. Similar observations have been made in [20, 22]. This motivates the use of vectoring of the CM signals for the cancelation of a number of disturbers. where γ i , υ 2 ( c d ) = σ i , υ 2 ( c ) / σ i , υ 2 ( d ) is the ratio of CM and DM noise variances. This ratio is generally greater than unity as CM port is usually more noisy than the DM port. We define β i ( c d ) = H i i ( c ) H i i ( d ) as the ratio of the frequency response of diagonal channel coefficients of the CM and DM channels. This ratio is greater than one when H i i ( c ) > H i i ( d ) , which holds at high frequency tones and/or longer loop lengths. This has also been observed in  for the CM channel using the binder sheath. ℛ i ( d ) , sub ≤ log 2 1 + Γ - 1 S i ( d ) ( 1 + ( N - 1 ) α 2 ( d ) ) . From (25) and (26), we can see that when β i 2 ( c d ) γ i , υ 2 ( c d ) is high (which occurs at high frequency and/or longer loop lengths as noted earlier). This shows that a substantial rate enhancement may be realized with the vectored CM-DM processing at longer loop-lengths. where ij th element of H(cd)is H i j ( d ) + K i H i j ( c ) and the i th sample of v(cd)is given by V i ( d ) + K i V i ( c ) . With such a vectoring approach, the size of effective channel H(cd)remains the same and thereby receiver-complexity for the CM-DM system is comparable to that of the conventional, N-dimensional vector DM processing. Note that there is only one signal at each TP, so that the vectored channel matrix again becomes of size N × N at each tone. In fact, only O ( N ) multiplications are required per tone for the operation of linear combinations of the CM and DM signals. Hereafter we refer to this N × N equivalent channel as the N-dimensional CM-DM vectored channel at each tone. Studying this lower dimensional CM-DM joint processing in the vectoring context is important since the CM-DM combining at the TP influences the channel matrix (the CWDD parameter and the SNR), and hence the attainable rate with vectoring. It is important to understand the structure of this matrix well so that performance of the standard crosstalk cancelers on the equivalent signal after the TP level CM-DM combining can be assessed. We show later that the application of ZF canceler on N-dimensional CM-DM vectored system results in performance close to the SUB of the same system. In what follows, we study the theoretical capacity of the considered CM-DM system by using the CWDD property of the resultant channel H(cd). α ( c d ) = max i , j ≠ i H j i ( c d ) H i i ( c d ) = max i , j ≠ i H j i ( d ) H i i ( d ) 1 + K i H j i ( c ) H j i ( d ) 1 + K i H i i ( c ) H i i ( d ) ≤ α ( d ) max i , j ≠ i 1 + K i β i ( c d ) α ( c ) / α ( d ) 1 + K i H i i ( c ) H i i ( d ) . η ( c d / d ) ≤ max i , j ≠ i 1 + K i β i ( c d ) η ( c / d ) 1 + K i H i i ( c ) H i i ( d ) . Ratio of CWDD parameters of N -dimensional vectored CM-DM and DM channels versus frequency at loop lengths of 800 m and 1000 m.
where h i ( c d ) denotes the i th column of H(cd), S i ( c d ) = σ x , i 2 σ υ ′ , i 2 ( c d ) , and σ υ ′ , i 2 ( c d ) = σ υ , i 2 ( c d ) H i i ( c d ) 2 denote the crosstalk-free SNR and noise after FEQ for the CM-DM system, respectively. The values of the rates achievable in these cases of concatenated CM-DM, the N- dimensional vectored CM-DM and the vectored DM, are taken up later in Section 7, dealing with simulations and numerical results. It will be shown there that while the concatenated system produces the best results in all situations, the rate performance of the lower complexity N-dimensional CM-DM processing is nearly identical to that of the concatenated system at larger frequencies or loop lengths. Next, we describe the proposed CM-DM processing with the ZF receiver in order to achieve the SUB. and A N denotes an N × N matrix whose diagonal elements are 1 and magnitude of non-diagonal elements is upper bounded by α ( c d ) . Also, the structure of the matrix B N is same as that of A N except that the magnitude of the last diagonal element is also upper bounded by α ( c d ) . The reader is referred to  for details. We now derive an upper bound on ψ i ( c d ) , zf in the following Lemma 1 for the case of a ZF receiver applied on the vectored CM-DM combined signal. ψ i ( c d ) , z f ≤ 1 + ( N - 2 ) α 2 ( c d ) N - 1 + ( N - 1 ) 2 α 2 ( c d ) 1 + ( N - 2 ) α 2 ( c d ) N - 2 1 - ( N - 1 ) α ( c d ) 2 N .
det ( A N - 1 ) 2 ≤ 1 + ( N - 2 ) α 2 ( c d ) N - 1 , det ( B N - 1 ) 2 ≤ ( N - 1 ) α 2 ( c d ) 1 + ( N - 2 ) α 2 ( c d ) N - 2 .
det ( A N ) ≥ 1 - ( N - 1 ) α ( c d ) N .
( N - 1 ) α ( c d ) < 1 .
ψ i ( c d ) , zf ≤ 1 + ( N - 2 ) α 2 ( c d ) N - 1 + ( N - 1 ) 2 α 2 ( c d ) 1 + ( N - 2 ) α 2 ( c d ) N - 2 1 - ( N - 1 ) α ( c d ) 2 N .
The condition in (36) together with (37) completes the proof of Lemma 1. It has been shown in  that noise enhancement factor of the ZF receiver for the DM system is close to unity due to the CWDD property of the DM channel. Since the N-dimensional CM-DM vectored channel possesses stronger CWDD characteristic than the DM channel, ψ i ( c d ) , zf is also close to unity. This implies that the ZF receiver can achieve performance close to the SUB of this lower-dimensional CM-DM system. Cendrillon et al. have also presented an upper bound on the noise enhancement of the ZF canceler for the DM system. However, the upper bound in  is conditioned to exist for a limited number of users (N ≤ 25) and bandwidth (upto 12 MHz), whereas the upper bound in (33) is applicable with the condition ( N − 1 ) α ( c d ) < 1 , which is typical for a large number of users and frequencies. Hence, the derived bound presented here can also be used to predict accurately the performance of high-bandwidth VDSL2 (newest standard of xDSL) system. A lower bound on ψ i ( c d ) , zf is also presented in Appendix 1. X ̃ i = X i - C 2 ( c d ) ( i , : ) x + v ( c d ) H i i ( c d ) - C ( c d ) ( i , : ) v ( c d ) H i i ( c d ) . ψ i ( c d ) , azf ≤ ( N - 1 ) α 2 ( c d ) + ( N - 1 ) ( N - 2 ) α 2 ( c d ) σ x , i 2 + σ υ , i 2 ( c d ) H i i ( c d ) 2 + ( N - 1 ) α 2 ( c d ) σ υ , i 2 ( c d ) H i i ( c d ) 2 . Note that with all combined CM-DM values replaced by DM channel values, (40) also holds for the vectored DM case. It can be seen from (40) that the AZF receiver can perform better for the CM-DM system than the DM signals at higher frequencies and/or longer loop-lengths (since α ( c d ) ≤ α ( d ) and H i i ( c d ) 2 ≥ H i i ( d ) 2 ). Thus, the rates of the ZF receiver with the vectored CM-DM processing will clearly be higher than those with DM processing alone, because the effective channel matrix after combining is more strongly CWDD in the former case. In general, it can be seen that the performance of the linear receivers can be improved with the vectored CM-DM processing. In the absence of alien crosstalk, noise at different TPs is spatially white. This assumption was used in the analysis for CM-DM processing in the preceding sections. In the presence of the alien crosstalk originating from the external noise sources, noise among different TPs experiences a high spatial correlation. This fact has been emphasized in many publications [3, 10, 30, 31]. Alien crosstalk can be particularly troublesome because it originates from other transmitters or channels that are not part of the system under design. Sources for alien crosstalk are, for example, RFI ingress, and signals from other DSL services. Cancelation of alien crosstalk is more involved and different techniques can be applied for its mitigation. One way is to exploit the spatial correlation by incorporating a whitening filter prior to applying cancelation algorithms. The presence of noise correlation clearly helps in mitigating the alien crosstalk. As such, a unity correlation (perfect correlation) completely eliminates the alien noise whereas there is no improvement if noise is uncorrelated. It is known that the non-white component of the noise (i.e., alien noise and crosstalk coupling from adjacent pairs) in the CM channel is correlated with the corresponding noise components in the DM . In case of alien noise originating from a single or small number of noise sources, the correlation between DM and CM signals is strong. This high correlation can be used effectively to mitigate the alien noise in the DM channel. In what follows, we first extend the optimal linear combination of CM and DM signals at each TP in the presence of alien crosstalk. Later, we coordinate the single-TP CM-DM processing to obtain N-dimensional CM-DM system and study its capacity. From (17) and (43), it can be easily shown that K i,a = K i for uncorrelated noise (ρ = 0). Similar to white noise, we can show that the linear combination approach maximizes the SNR in the presence of alien crosstalk. y ̃ ( c d ) = W - 1 H ( c d ) x + W - 1 v a ( c d ) . H ̃ j i ( c d ) ≤ H i i ( c d ) det ( W ) det ( W ¯ n p ) + α ( c d ) det ( W ¯ p ) + ( N - 2 ) α ( c d ) det ( W ¯ n p ) ∀ j ≠ i .
α ̃ ( c d ) ≤ det ( W ¯ n p ) + α ( c d ) det ( W ¯ p ) + ( N - 2 ) α ( c d ) det ( W ¯ n p ) det ( W ¯ p ) + ( N - 1 ) α ( c d ) det ( W ¯ n p ) . S ̃ i , a ( c d ) ≤ H i i ( c d ) 2 σ x , i 2 det ( W ) 2 det ( W ¯ p ) + ( N - 1 ) α ( c d ) det ( W ¯ n p ) 2 . Since CM signals are highly correlated with the DM signals, S ̃ i , a ( c d ) for N-dimensional CM-DM system can be significantly higher than the DM counterpart. Consequently, the N-dimensional CM-DM processing gives higher data rates than the DM processing. However, it is noted that the whitening procedure destroys the CWDD characteristic ( α ̃ ( c d ) > > α ( c d ) ) of DSL channels and thus the ZF receiver does not achieve the SUB. 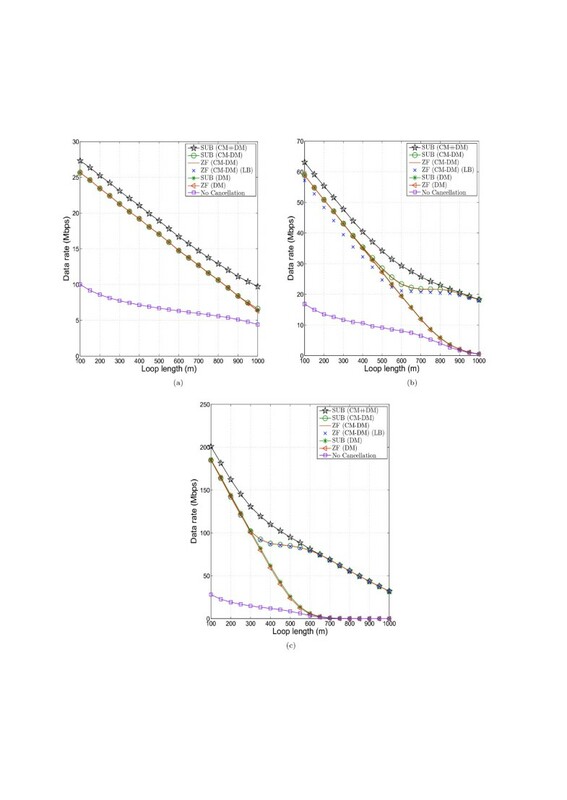 Non-linear receiver ZF-DFE  and SAGE based iterative receiver proposed in  are alternative candidates for the mitigation of alien crosstalk even with reduced CWDD characteristics of the DSL channels. In this section, we investigate the performance of the vectored CM-DM processing using computer simulations and numerical results based on derived bounds. We consider Annex C band plan  which corresponds to three upstream frequency bands. We assume 10 TPs of equal length in a binder while other simulation parameters as per the ITU-T standards  are listed in Table 1. We adopt the stochastic DM-channel model of  and use the proposed CM channel model in (6) for the simulations. We simulate the capacity of the proposed vectored CM-DM processing and compare with the DM processing in all the three upstream bands. For the white noise case, we demonstrate the rate performance of the ZF receiver for the N-dimensional CM-DM system model considered here. We also plot the data rates to verify the upper bound on the noise enhancement of ZF receiver in (33) for the N-dimensional CM-DM system in the absence of alien noise. Figure 4 shows that concatenating the vectored CM and DM signals provides higher data-rate than the DM signals alone over a broad ranges of frequencies and loop lengths. This is consistent with the observations made by Magesacher et al. . We also observe that when we combine the CM and DM signals optimally before vectoring, there is always a rate improvement, though its extent depends on the loop length and frequency. While the concatenated CM-DM performs best, as expected, at higher loop-lengths the performance of the N-dimensional CM-DM system seems to be nearly identical. (This is because the CM signal dominates at higher loop-lengths). 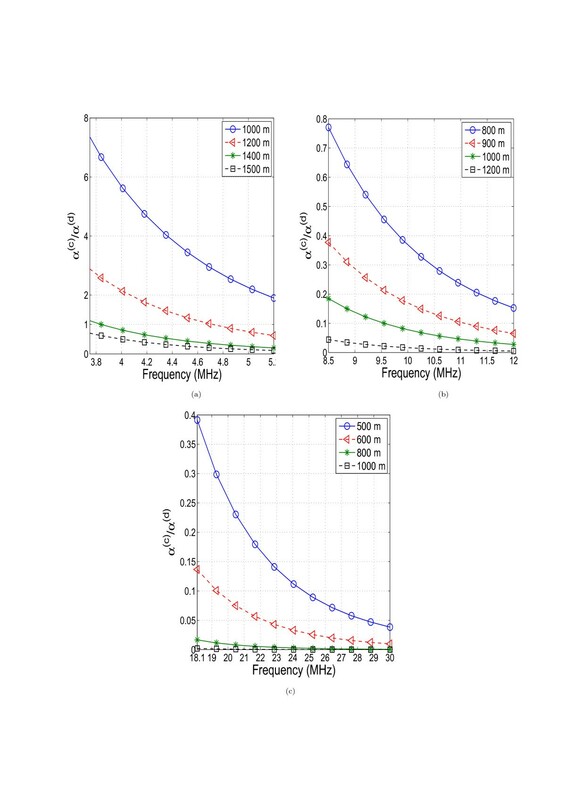 It is clear that there is a large gap between the capacities achieved with combined N-dimensional CM-DM and DM processing, which increases significantly with increase in the bandwidth and/or loop length. For lower frequencies and shorter loop lengths, however, the N-dimensional CM-DM processing achieves the same maximum data rate (SUB) as that of the DM processing. This is because the DM channel is much cleaner (less noisy) in this region. It can be further seen from Figure 4 that the ZF receiver achieves the SUB of the N-dimensional CM-DM processing. We also study the influence of the higher CM noise level on the capacity gain using the CM signals at high frequency tones in Figure 5. 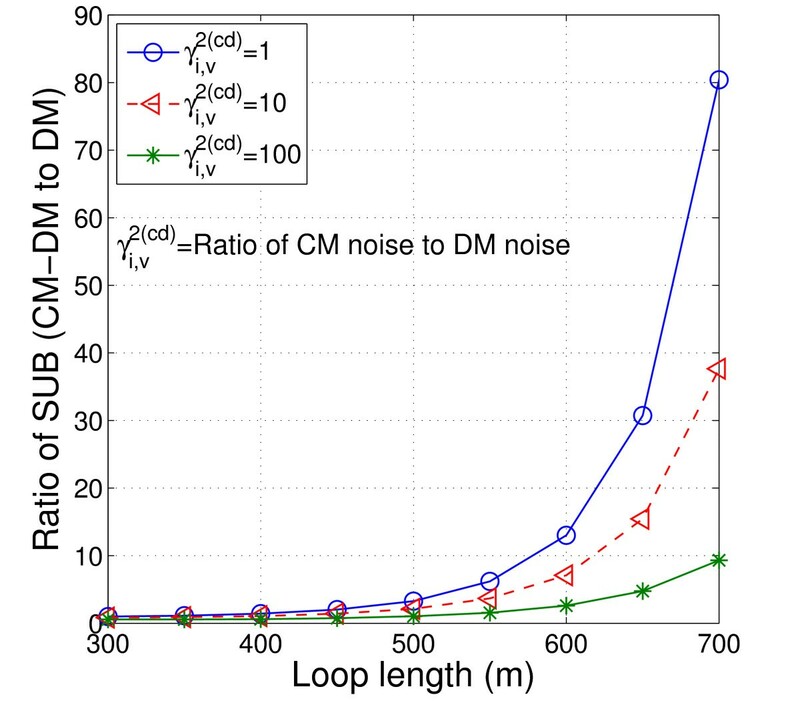 This figure depicts that there is a significant rate gain in the HFB using the N-dimensional CM-DM processing for longer loop-lengths even when the CM noise level is higher than the DM noise. Hence, in the absence of alien crosstalk, we can achieve higher data-rates at longer loop-lengths. Data rate (SUB) performance versus loop length of the N -dimensional vectored CM-DM and DM processing along with the ZF receiver for the three upstream bands. SUB with the concatenated (╫) vectored CM and DM signals is also presented. Effect of the CM noise on gain of data-rate (SUB) for the N -dimensional vectored CM-DM processing in the high frequency band. To illustrate the effect of alien crosstalk, we consider noise correlation values of 0.99 and 0.50 and equal CM and DM alien power of -100 dBm/Hz. Figure 6 shows the capacity of the vectored N-dimensional CM-DM and DM signals after whitening the correlated noise. An upper bound on the SUB (indicated in (49)) is also presented. It can be seen that the data-rate performance improves with increase in noise correlation of the alien crosstalk. It can also be observed that the N-dimensional CM-DM processing is of much greater importance in the presence of alien crosstalk. As such, data rates of the N-dimensional CM-DM is greater than that of DM with pronounced improvements at longer loop-lengths and higher frequencies as shown in Figure 6. Data rate (SUB) performance of the N -dimensional vectored CM-DM and DM processing versus loop length in the presence of alien crosstalk for the three upstream bands. Alien crosstalk correlation coefficient of 0.99 and 0.50 and alien power of -100 dBm/Hz (for both the CM and DM systems) are considered. We have investigated the use of CM signals to increase the rate and reach of the VDSL systems in upstream transmissions. A vectored system consisting of both CM and DM signals has been proposed to enable the effective cancelation of crosstalk. We have shown that simply combining the CM and DM signals optimally results in rate improvement without significant increase in complexity. Further, vectoring such combined signals enables ZF type receivers to achieve the capacity due to the increased diagonal dominance of the resultant N-dimensional CM-DM channel matrix. 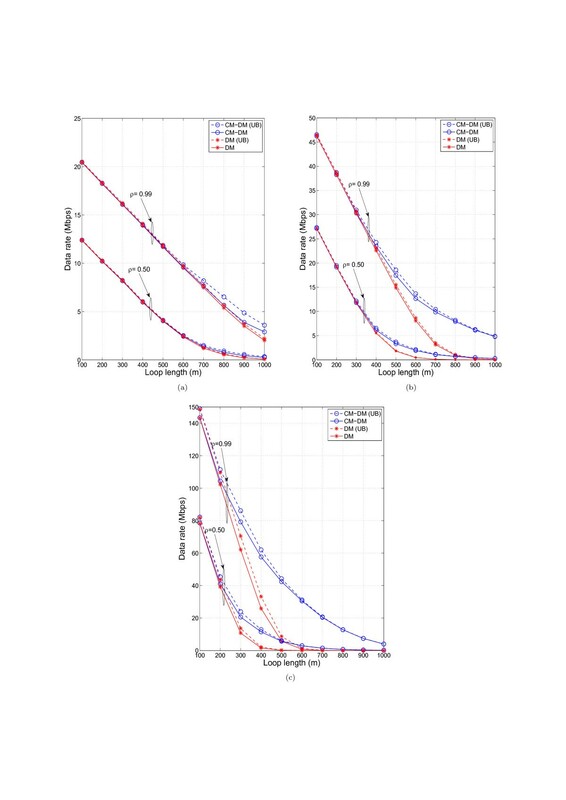 We have shown that the rate gain with CM-DM joint processing is a strong function of the loop length and frequency. In the presence of alien crosstalk, use of the CM signals has been shown to increase the data rate significantly. det ( A N ) 2 ≤ ( 1 + ( N - 1 ) α 2 ( c d ) ) N - 1 .
det ( A N - 1 ) 2 ≥ ( 1 - ( N - 2 ) α ( c d ) ) 2 ( N - 2 ) . Ω b = ( N - 1 ) λ b u - μ λ b λ b u - λ b l .
σ λ b 2 = tr ( B N - 1 † B N - 1 ) N - 1 - μ λ b 2 ≤ ( N - 1 ) ( N 2 - 3 N + 3 ) α 2 ( c d ) + ( N - 2 ) ( N - 1 ) 2 .
λ b l = μ λ b - σ λ b ( N - 2 ) 1 / 2 .
λ b l = N - 2 N - 1 - ( N - 2 ) ( N - 1 ) 2 ( N - 1 ) ( N 2 - 3 N + 3 ) α 2 ( c d ) + ( N - 2 ) . λ b u = ( N - 2 ) α ( c d ) + 1 . We substitute (54), (58), and (59) in (53) to obtain a lower bound on |det BN-1|2. Then substituting (51), (52), and (53) in (32), a lower bound on ψ i ( c d ) , zf can be obtained. international telecommunication union-telecommunication (standardization sector). This study was supported by research grants from Conexant Systems Inc. USA, and IIT Delhi. An earlier preliminary version of this study consisting of discussion on the CM channel model was presented at the Annual IEEE Indicon Conference, INDICON 2008, IIT Kanpur, India, in December 2008. The authors would like to thank the anonymous reviewer for useful comments which helped to improve the quality of the article.